Goodbye Omura, Kumamoto here we come! 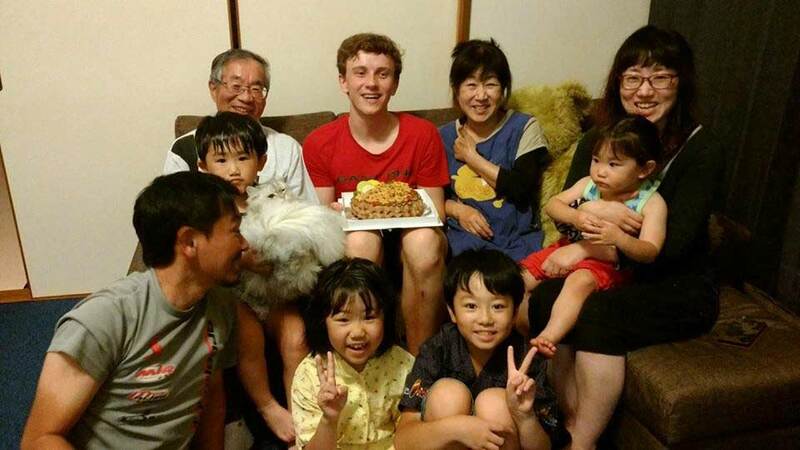 This was my last morning in Omura and time to say goodbye to my host family. The mayor of Omura came to greet us farewell and after a tearful goodbye, we left for Kumamoto. My host family had prepared a traditional “bento” lunchbox for my trip, with lots of good food. When we arrived in Kumamoto we visited 第一高校, a very nice high school. Here we met up with groups of English major students and got to talk with them. It was a fun and interesting experience; to share our culture, and hear the dreams of the students. Later I met my awesome host mother, who came to pick me up. She is a programmer, assistant manga artist and in general a supermom. They had also prepared a really nice table with their names, nicknames, and a warm welcome for me. We went to Kendo training with the kids and their skills really amazed me. 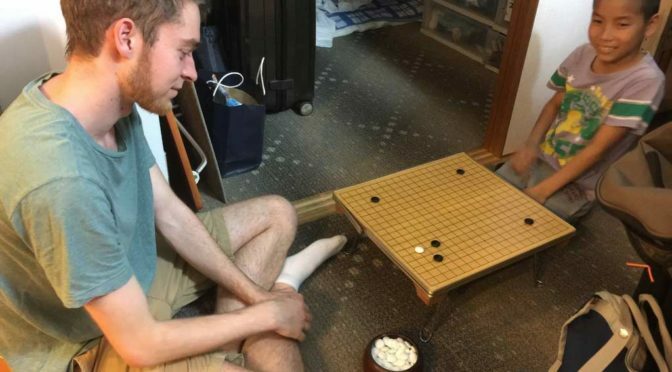 All of the kids also happened to play 囲碁 (Known as “Go” in the west), so me and the youngest boy played a game together. Today, was the day that the Arigato Event in Omura would take place in the evening. But before that, we visited Matsubara Elementary School during the day. 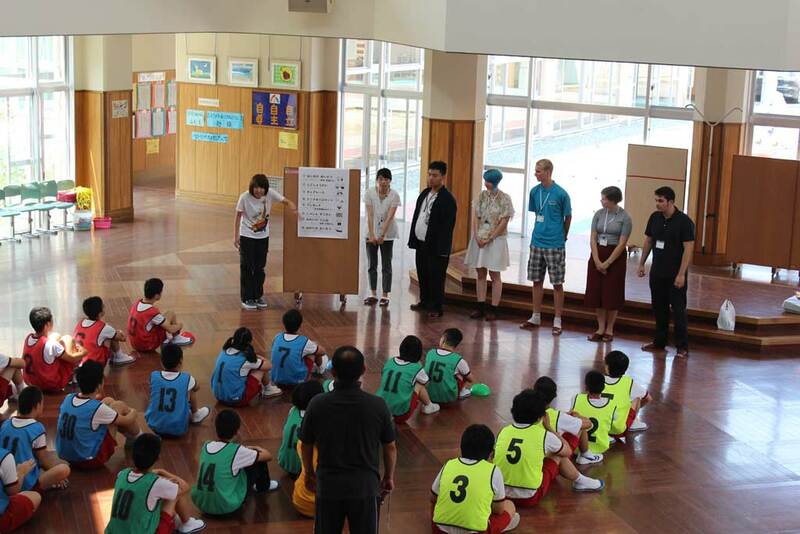 After a short morning meeting at Kori Community Center, we moved to the elementary school. During our visit at the school, we were divided into groups of two, or three. I was in the same group as Juuso, and Nicole. The visit was divided into 5 sessions, 3 before lunch and 2 after. Our first session was science class, with the fifth graders. The lesson today was about the anatomy of a fish. The second session was something called moral education with the sixth graders. This one was a pretty impressive lesson. In the lesson, they were teaching, and discussing lifestyles. The third session was math with the first graders. It was pretty funny, although the kids were pretty noisy. After lunch, we had a playtime session with the kids. We did some clay figures with the kids we were playing with. This was the first time I saw Juuso’s impressive skills with clay. The next session was cleaning. 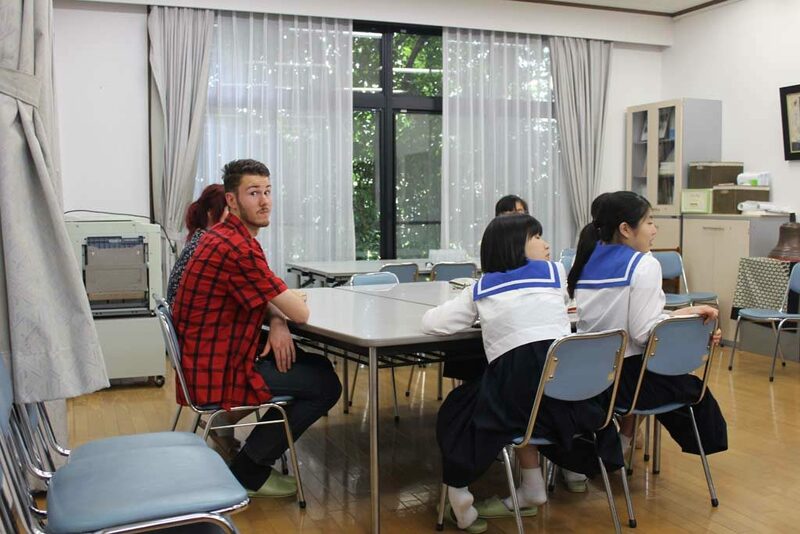 A little bit of trivia: Japan doesn’t have janitors in the school’s, the kids are the ones cleaning it. What we did was some floor sweeping, moving around some stuff, and mopping. 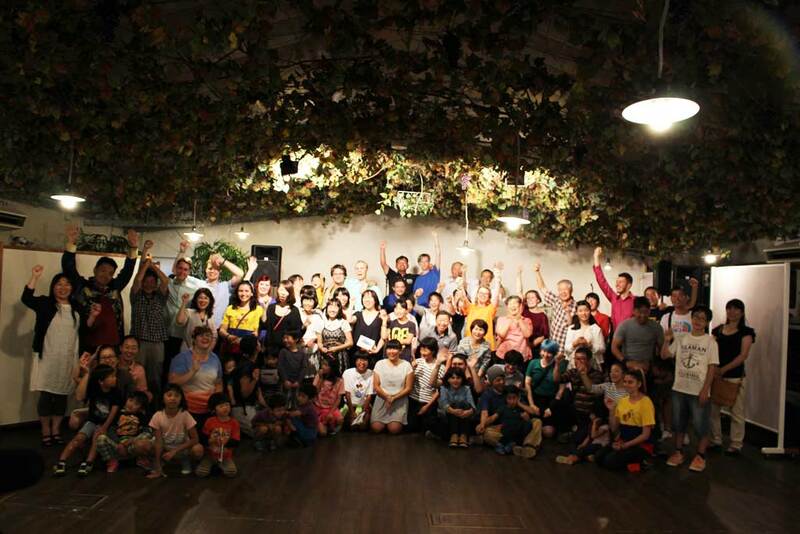 The last session was Life Environmental education. As I am writing this blogpost, I still have no clue what that subject was about. But the lesson was about wheel chairs, and how to operate it. Many of us were impressed by the kids. They have a different level of concentration during classes, and to me, it seems like they have a lot more dedication in school. Even though it is only an elementary school. Some of the subjects and classes were really interesting too. Some of which I wish I had had in my elementary school as well. We left the elementary school 15:30 for Shushu, the site for the Arigatou event of Oomura. Shushu is a small restaurant, a little way outside of Oomura city. We arrived there by bus. When we arrived at Shushu We quickly started the preparations for the Arigato event. Rehearsal started almost immediately after being briefed of the plans for the evening. I was particularly nervous, since I was one of the two participants to read a thank you letter, the other one being Charlotte. I am also one of the soloists. Although, I think most of us were nervous because of the performance. The event was like a party with nice food and drinks. Our own performance in Oomura was a little bit shorter than what it would be in other cities. The rest of the entertainment during the event was provided by a local cover rock band. Our performance went smoothly. This was the first time we performed the whole Japan medley in front of a crowd. After seeing the slide show for Omura, it was time for reading the letters. I was having a hard time reading my letter though, since I wrote it in hiragana, and realized that it was very hard to read. Shoko had to help me reading the letter. I probably should have written it down in romaji instead. Charlottes letter reading went well. After that, we had a one last performance, which was the song “Minna ga minna eiyuu” (literal translation: Everyone is everyone’s hero). I was singing solo for the second verse. The song overall went well though, considering that we had very few opportunities to rehearse it. The band was responsible for the rest of the party. It was really fun. The band was incredibly skillful. They performed top rock and pop hits of the 80s and 70s, like ToTo – Africa and Earth, Wind and Fire. We all had a good time the rest of the evening after taking the big group picture. There were many smiling faces and laughter. Oh, and also lots of photos! Though our performance wasn’t perfect, it was a really memorable evening. I was very satisfied. The event ended around 10 o’clock. We were all very tired. But the whole evening was great fun. It was especially fun for many of us since this was the last day with our host families, so everyone was enjoying every last minute of it. I feel sad, but also exciting to know that we were leaving Omura for Kumamoto the next day. I think that everyone felt the same as me, that today was a fun and experience filled day that we would remember for a long time. 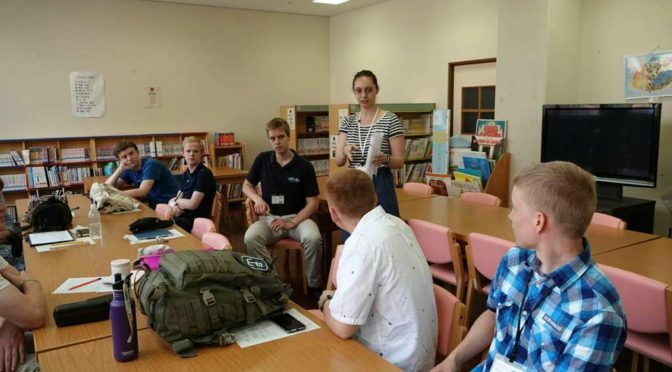 The first stop today day was a Special Education School in Oomura called Nijinohara. We stayed there the whole morning and after lunch we went to a dojo to learn about kyudo, which is basically Japanese archery and a form of Japanese martial art. 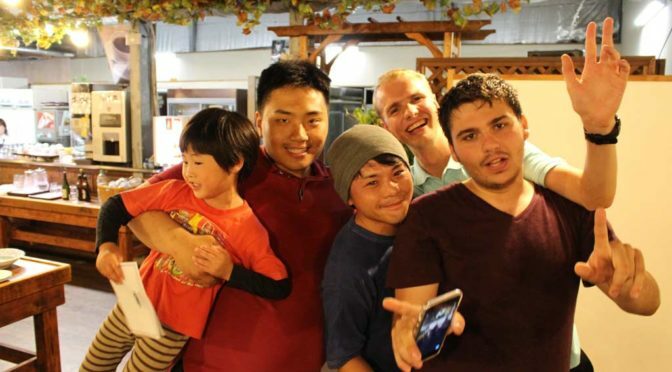 This was my second time visiting Nijinohara with World Campus Japan, and I have some great memories from last time so I was very much looking forward to being able to go there again. 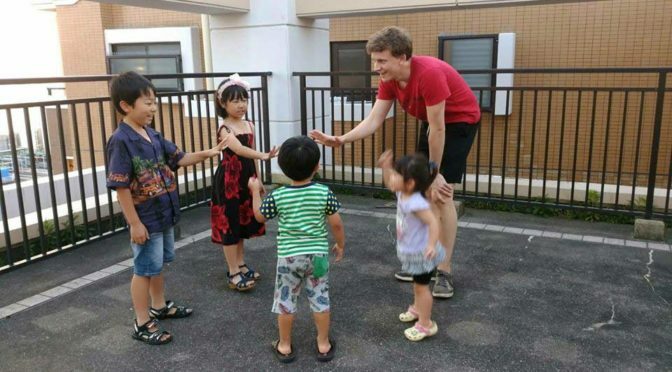 At the school we were welcomed by several curious faces and some enthusiastic “Hello!”:s. After introducing ourselves and dancing a bit for the children, it was time to split up to different classes and do some team activities together. First, we had a little chat and question session to get familiar with each other. Then we engaged in a chair racing competition followed by an English word game. There were many students that were very excited and wanted to interact, and there were some who were a bit more shy or reserved, but one thing that was very clear was that everyone wanted to be a part of the activities. Some of the children didn’t at all use their voice to communicate, so when it was time for self-presentations the teachers helped them with reading the presentation. Others needed help from teachers or their friends to stand up, sit down and move around. It made me so happy to see everyone working together to make sure to include all of the students in the activities. I had a great time and the students seemed to enjoy it as much as I did. In the afternoon, having arrived at the dojo we got to listen to a lecture about kyudo and see a demonstration performed by the teachers. 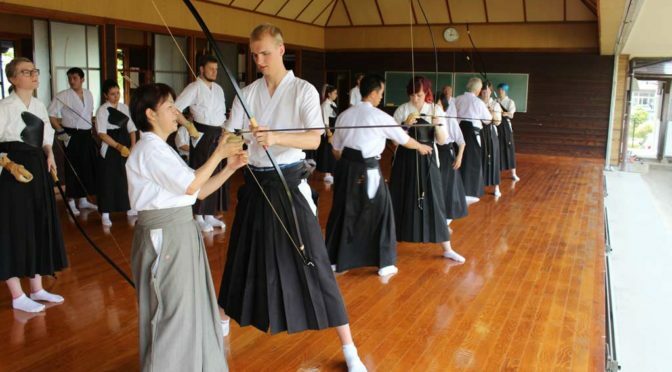 Then we got to change into kyudo clothes and try the technique ourselves. First, we went through the basic steps using a practice bow consisting of a handle with a string attached to it. 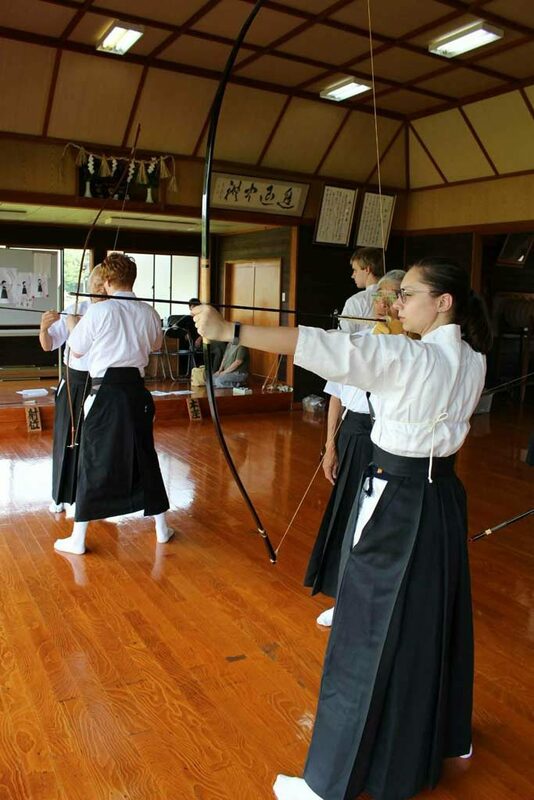 After that we got to practice with real bows and eventually line up to shoot with the teachers’ help. Keeping the arrow in place was a bit tricky and drawing the bow required a certain amount of strength, but I enjoyed the challenge and I think we all had a lot of fun.